The science of sustainable energy requires making more efficient means of storage and accessibility for your harvested power...but sometimes it can have bonus advantages, when properly plotted. Unlike oil spills which contaminate massive swaths of ocean, or fracking which can cause a release of chemicals potent enough to set tap water afire, no one worries when there is a solar power leak (some people even pay for these raw materials...look at any tanning salon.) 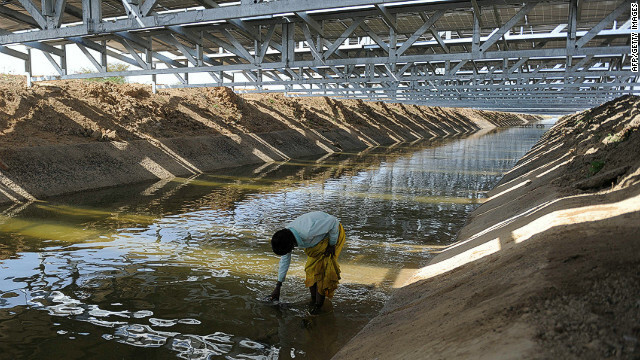 Now, a community in India has made gathering solar energy an even more useful endeavor, thanks to positioning the solar panels over irrigation canals to thwart extra evaporation. It's like the peanut butter and chocolate of conservation. According to Yahoo, in the Gujurat state of India, the booming business of solar power is setting precedents for the rest of the nation and likely the world. By building solar panels over irrigation canals, communities are left not only with more free land space, but also contribute to the efficiency of their farming by not losing excess water to evaporation. 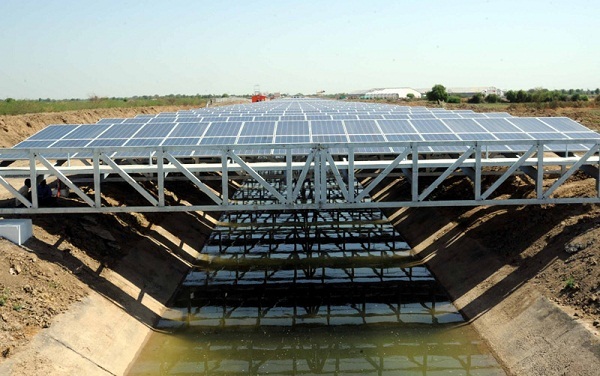 A plant in Vadodara which opened in October produces 10 MW of power thanks to 33,800 solar panels stretched across 3.6 km of irrigation canals (which it in turn powers the pumping distribution of.) On a nice day, 50,000 electrical units (that's 50,000 hours of usage at 1,000 watts) are sent from the solar into the system. While the canal-covering solar panels are more expensive to build, they are easily accessed for cleaning and maintenance. The water below will eventually tend to 4.45 million acres via some 75,000 km of canal throughout Gujurat and Rajasthan, known as the Sardar Sarovar project. Already the Vadodara plant has made 16 hectares of land available, and is projected to conserve some 90 million liters of water per year. The benefits add up: the creation of the solar infrastructure also powers more jobs. Overall, the Indian government plans to gather 100 MW of power from canal-top photovoltaic panels by 2017. By 2022, the nation intends to have over 10% of its total energy created by solar power. The effort is not lost on the rest of the world. U.N. Secretary General Ban Ki-Moon recently visited and remarked, "I saw more than glittering panels – I saw the future of India and the future of our world...I saw India's bright creativity, ingenuity and cutting-edge technology." Crafty conservation can help fuel the future in ways we haven't even yet pondered. The fact that a major nation has stepped up to address the power problems in an efficient and intelligent way brings hope for the rest of the world. Maybe soon we can stop shooting off mountaintops and drilling beneath oceans to gather our energy. Let's start using our power - and our methods of power collection - for good. Yet another plus: all that water saved from evaporation could be made potable for poverty-stricken regions. Win, India. The property holder is credited for the additional kilowatts toward the finish of each metering period. We are Uniper: an international energy company with about 12,000 employees. We combine a balanced portfolio of technologically advanced large-scale assets with outstanding technical and commercial expertise.These assets and capabilities enable us to deliver flexible, energy compliance, bespoke, competitively priced energy products and services with agility, precision and speed.